Located in the heartland of the Austro-Turkish battlegrounds and by the river Mur, once an important trade route, Bad Radkersburg was an important centre for the Habsburgs and their strive to secure the south-eastern edge of Styria. Today, Bad Radkersburg is a popular tourist destination: In a very remote corner of Austria, just by the border to Slovenia and not far from Hungary, Bad Radkersburg occupies a beautiful spot. It is part of the "Road of the Castles" (and thus described in the respective article here on TourMyCountry.com), and well-connected to several spas and good wine areas of Styria. Yet, the town doesn′t simply have a castle; it more or less IS a castle - and thus a good spot for top-notch sightseeing. 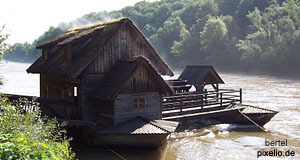 Start with the Heimatmuseum or town museum, which will give you the historic background information that you will need to fully appreciate the town and the folk-stuff that comes as usual in the regional shades typical for the area where you currently are in Austria - in this case, of the Styrian kind. The parish church of Bad Radkersburg dates back to the 15th century and its cemetery is a good spot to look for traces of the days when the town was a heavily fortified bastion against the Turkish threat. There are several tombs of noblemen who where here to defend the town and secure the Mur River. Most of the houses around the Hauptplatz or Main Square were built in the 15th and 16th century. From many you can tell the prosperity that the merchants of Bad Radkersburg once had, echoing the significance of the Mur as a trade route. It is also a good spot to catch the atmosphere of a very tranquil Austrian town which clearly had its best days several centuries ago. Especially if you travel with children or childish adults like myself, you can spend a while tracing the fortifications, of which most are not medieval, but built in the 17th century. This was the time when the Turkish Wars peaked and the Austrians gradually gained grounds after the defeat of the Second Siege of Vienna. Otherwise, Bad Radkersburg still has the spirit of an outpost. The appeal of the surroundings is quite clearly a rural one. In fact, there are no actual attractions even in the wider surroundings. So either you enjoy nature, food and tranquillity - or you move on at least until Leibnitz (which is not a metropolis itself, but well-connected to Graz). Or you move towards the Burgenland and follow the "Road of the Castles", for which Bad Radkersburg makes a good starting point. This theme road is commonly done by bicycle. For day-trips to Slovenia, you will require a passport and possibly - depending on your nationality - a visa.